Gin is made by extracting flavour and aroma compounds from botanicals in the form of essential oils; this flavours the spirit. The simplest way to do this is by compounding – either by adding essences (flavourings) directly to spirit or macerating botanicals in spirit. This second method often adds a little colour. A good example of this is Ableforth’s Bathtub Gin. Other methods involve distilling a mixture of spirit and botanicals, of which there are three main types: Pot distillation: Botanicals and spirit are added to the main body of a pot still, called a kettle, which is typically made of copper or steel. The still is then heated and the spirit extracts the essential oil. To increase the amount of oil extracted, the botanicals are often either cold or hot macerated (digestion) in the spirit before distillation. Vapour distillation: Botanicals are put into an infusion chamber (or ‘gin basket’) made up of perforated plates positioned at the top of the line arm of the still. During distillation, spirit vapour passes through the chamber and over the botanicals, extracting their flavours and aromas. The main benefit of this method is that it stops the botanicals from getting too hot and cooking, which can give the gin more stewed flavours. Vacuum distillation: Botanicals are distilled in spirit in an airtight system that is kept at a reduced pressure. As a result, the spirit boils at a lower temperature, which helps to extract finer flavours and aromas without cooking the botanicals. To satisfy EU regulations, all gin must be made using a base spirit that was distilled to no less than 96% ABV. As this is difficult to achieve on a pot still, most distilleries purchase their spirit from a third party. Typically, such spirit is made from grain – mostly wheat, which has a very clean flavour – or molasses, which has a richer mouthfeel and light sweetness. Another alternative is grape spirit, which has a light floral fruitiness. In the US, corn spirit is very common, which is clean with a light sweetness. Some distillers, especially in the US, do make their own base spirit, but this requires a column still to bring the spirit to 96% ABV. Common bases include rye, apples, pears, potatoes, sugar beet and honey. Most gins are made using highly rectified neutral spirit and so distillation cuts (heads and tails) are not as necessary as they are when making whisky or brandy. Instead botanical cuts are taken – this is because different flavour and aroma compounds have varying volatilities and come off the still at different points of the run. Initial flavours are often overpowering, eg. citrus, which will affect the gin’s flavours, so these are often discarded. Towards the end of the run, more heavy pine flavours appear that can add a slightly funky flavour to the final spirit and need to be avoided with a tails cut. Without juniper, gin can’t be gin. In particular, the berries (that are actually seed cones) of the Juniperus communis, otherwise known as common juniper. Their characteristic green, resinous, and piney flavour is due to the presence of the chemical compounds alpha and beta-Pinene. These days, the majority of juniper berries are imported from Tuscany, Macedonia, and other countries in the Balkans. Distillers are increasingly focusing on the source of their juniper, with some even utilising local supplies, eg. Hepple and Crossbill. Some American distillers have also started to use non-Communis varieties, which is allowed in the US. Angelica root typically comes from France, Belgium and Germany. It adds an earthy, slightly floral note to gin. It also helps to give a gin a perception of dryness. Like coriander seed, angelica is thought to have fixative properties. Some distillers also use angelica seed, which adds a subtle floral, hop-like character. Orange (bitter or sweet) and lemon are the most commonly used peels in gin production, although grapefruit (all colours) and lime are becoming increasingly popular. Although not essential, citrus can help to balance out floral and pine notes and provide a lively character. The powdered dried root of the iris flower (typically Florentine iris) has a bittersweet flavour with hints of violet and raspberry. In the majority of gins, as in perfumery, orris is added for its fixative properties, to help bind other botanical flavours together. These can often complement and highlight more floral elements of the juniper. Herbs commonly used include rosemary (which has a character similar to its culinary use), thyme, sage and mint. These flavours add depth and help to distinguish the gin, helping it to maintain its character in mixed drinks. cubeb berries, black and pink peppercorns, caraway, and fennel seed. All of these should be used in very small quantities, especially cardamom, as they can easily overwhelm the gin. 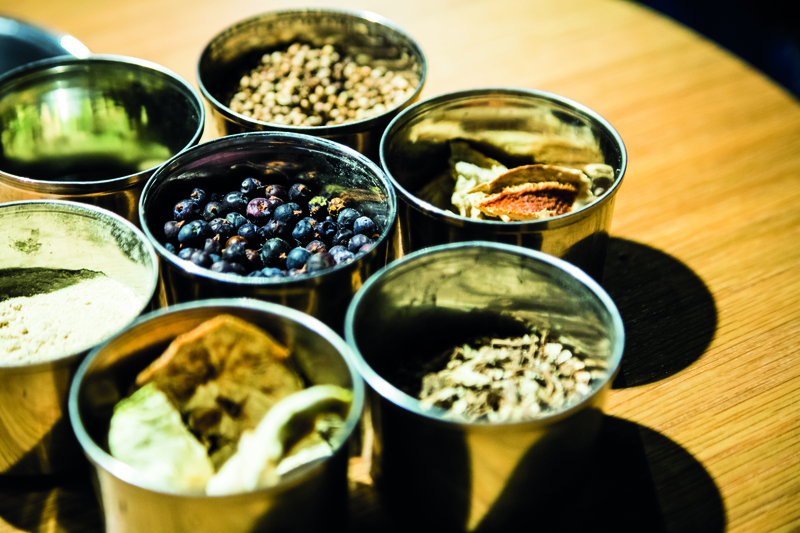 Fragrant and indulgent, these botanicals add high notes to the gin and can enhance both the flavours and aroma. The dried petals of flowers are usually used. Lavender is the most popular, but others include camomile, citrus blossoms, elderflower and meadowsweet. Given the delicate nature of floral botanicals, it can be difficult to extract the flavours. Many distillers use vapour infusion to achieve this. A long pre-distillation maceration of floral botanicals is not recommended as it can lead to an unbalanced gin.